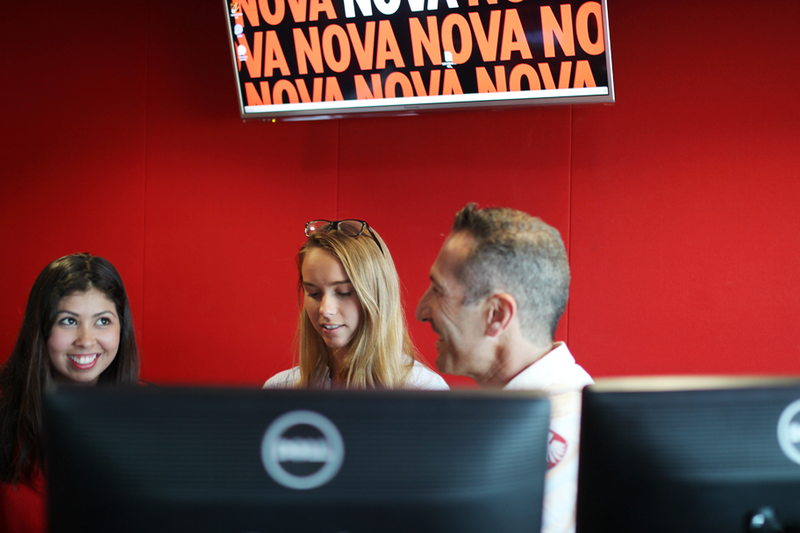 Today, the Macleay Advertising Copywriting class had the opportunity to poke around in the real world of capital city radio, with a tour of Nova’s Sydney studios. We arrived at the Pyrmont headquarters fashionably late. Well, just ten minutes. But in “media time” that’s like an hour. Still fashionable though #sorrynotsorry. 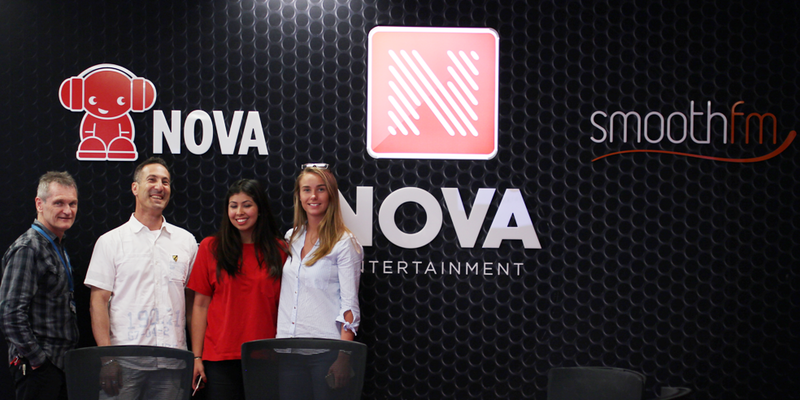 But look, we’ll rip the band-aid straight off now: we didn’t meet NOVA FM stars, Fitzy and Wippa. Being breakfast announcers, they’re in at 3am and out of the building by midday, maybe 1pm at the latest. So we didn’t see them in the flesh. But!! We did get to hang around in their studio, and sit in their chairs and talk into their mics – and view their view over the Anzac Bridge. We did see Kate Ritchie – part of NOVA’s drive time program which recently won Best On-Air team at the Australian Commercial Radio Awards. Kate just ran past us in the hall way on her way to a programming meeting. She smiled, laughed and said “Hi” then scurried into her meeting room. This was our first inkling of how frantic Sydney radio can be. We really saw frantic for real, when the Smooth FM program director, Peter Clay, raced through the office to fix a computer issue in the studio while drive-time presenter Anthony Davis was going live-to-air. It just really hammered home that sense: radio is immediate. When a problem occurs, it’s being broadcast live. We’ve spoken about it in classes, but until we saw Peter Clay taking charge like that, it was nothing more than an abstract thought. We also met Stephen Bruce, Nova’s sales manager. He and our guide, account manager Julian Dias, explained how they take an idea and making it rain moolah. It’s actually a really long process! It starts with the creatives coming up with their crazy ideas in the corner, they liaise with the content team to see how their ideas can be executed across different platforms: on-air, social media, websites – radio isn’t just radio any more. Then they get the sales guys involved, to get some sponsorships on it. Sometimes, it works in reverse – the sales guys will go to the creatives, flesh out an idea and then get the promotions and production team involved from there. Without hearing their real-world experiences seeing their ideas grow wings and flying onto the airwaves, again, we would have been left with just the abstract. Production was a huge highlight! We briefly met the current Australian Radio Producer of the Year, Darcy Milne, then commercial sound engineer, Shelly Mitchell spent the better part of an hour showing us the ad-making process. We’ve had a bit of experience with Protools, but until we saw Shelly working with it, we had no idea it was so complex! There’s so much sound layering and automation in every 30 second ad. Hours of work goes into it. And there’s also a lot of psychology too – the ad sound has to create the right atmosphere to fit with the audience demographic. You have to really understand the listener. All in all, our tour of Nova was an eye-opener. A lot of thanks go to account manager, Julian, who took two hours out of his Tuesday to show us around and answer all our questions. What a legend! Photos and Blog by Emma-Marie Horn. 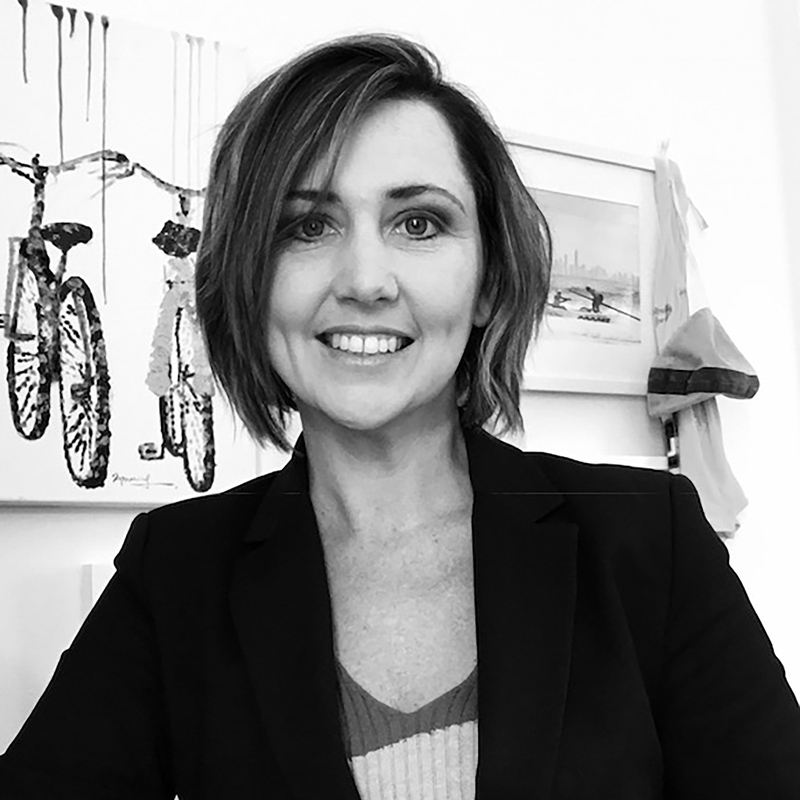 Guest Lecturer – Advertising & Media Faculty, Macleay College. Building on its reputation of offering Australia’s most progressive multi-media journalism course; it’s focus on entrepreneurship in Marketing & Business; and featuring a dedicated degree in Advertising & Media, Macleay College is extending its selection of courses to Diploma and Bachelor qualifications in Digital Media. Industry advisory panel members (L to R) Ross Raeburn (UM), Felicity Coonan (Animal Logic), Ian Thomson (Macleay College), Chantal Abouchar (The Studio), Andrew Barnum (Peopleness) and Kim Chatterjee (UX Consultant) were some of the leading consultants involved in developing Macleay College's new courses in Digital Media. It’s become a well-worn catch-cry that “the future is digital”, but reality is that we’re already immersed in a world where information, communications and data are propelled through the Internet as binary code. As geeky as this might sound, the wonderful reality of digital media is that this information is instantaneously re-translated for us at our point of retrieval (on our smart TVs, laptops, tablets and phones) as articles, stories, photos, films, music and games to inform, engage and entertain us. Digital Media has become the currency of communication for generation NOW. And because it allows resources to be copied, transmitted and shared without loss of quality, its expansion into all areas of our personal, professional and creative lives is pre-destined. 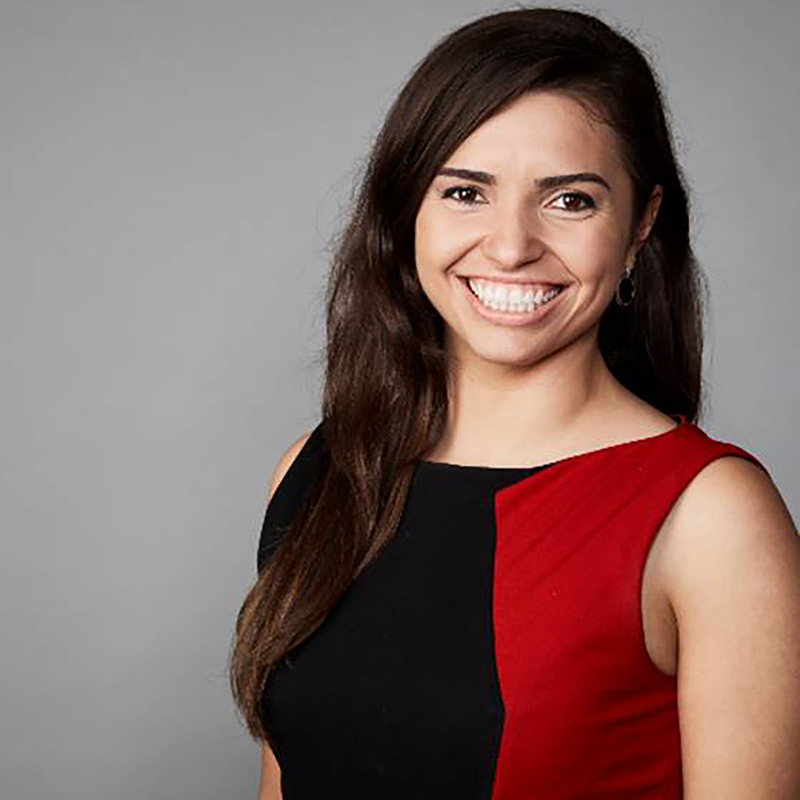 “In the future, every business will need to have a person who can create digital content” claims Chantal Abouchar, Founder and CEO of Australia’s first Media Accelerator THE STUDIO as she took part in Macleay College’s series of high-ranking industry advisory panel consultancies in order to develop the new Diploma and Bachelor of Digital Media courses. “The future of media changing is so quickly. If you think about Occulus-Riff and the Drone technologies that are coming out, we need people who understand the potential of these emerging technologies and can coordinate creative and business opportunities around them” adds panel consultant, Fullbright Scholar and Master in Communications Science and International Affairs from Columbia University, Andrew Robinson. The 2-year degree course in Digital Media features Macleay College’s commitment to industry focused education in innovation, enterprise and communications. The 3 trimester system allows the same volume of learning from a 3-year university degree to be delivered in two thirds of the time, keeping well in-trend with the career focus of the college and the fast moving nature of the digital media technologies. “Graduates will be well equipped to be adaptable and manage the fast change expected within the digital media industries” said consultant and panel member Dr Graham Salter. 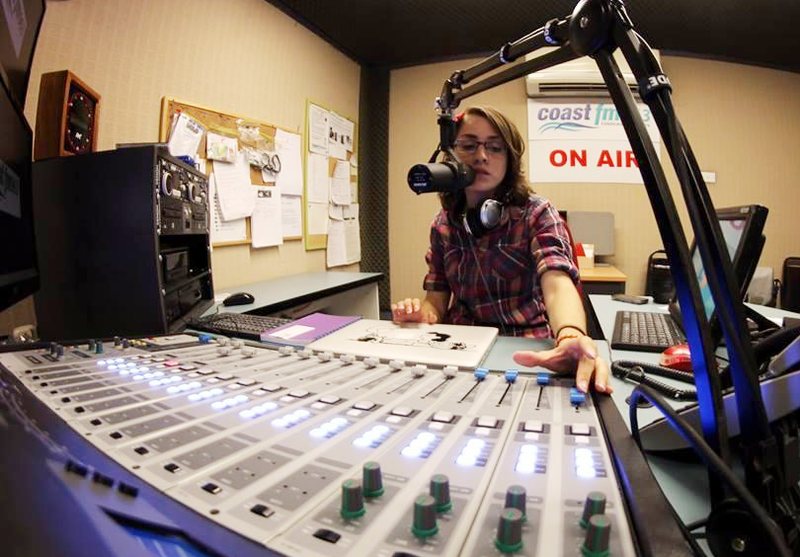 An alternate entry pathway to the degree is a 1-year Diploma of Digital Media, which allows students without the ATAR qualification to articulate into the degree if they achieve a Credit average or higher. This accommodates students who are well suited to Digital Media, but don’t come from a more formal academic background. Students identify one area of specialisation, such as DIGITAL PHOTO & VIDEO CREATION, WRITING FOR DIGITAL COMMUNICATIONS or DIGITAL MARKETING or BUSINESS, but complement this with elective units to broaden their skill sets. “Career paths are no longer linear, we need to be developing creative thinkers, strategists, problem solvers who can apply a concept to any form of media and are not limited by the media they have training in” added course designer and Macleay College Head of Faculty, Ian Thomson. The course offers core units in CREATIVE THINKING, DIGITAL DESIGN, BEHAVIOURAL PSYCHOLOGY, CONTENT STRATEGY, STORY & NARRATIVE and RELEVANT DISRUPTION & GLOBAL ENGAGEMENT – just to name a few. “When we employ graduates at Animal Logic, the people who have longevity and will be valuable are those who are curious, have a hunger for knowledge, an aptitude for design thinking, and who think ‘bigger’ about the world” mentioned Animal Logic Art Director Felicity Coonan at the course development panel. Hence the ‘big picture’ approach to the core units of study in the course, with enough specialisation and elective options to develop multiple skills sets, such as combining studies in VIDEO PRODUCTION with electives in DIGITAL MARKETING. “You as a student must be able to tell your story, in whatever medium, as a response to the brief – no matter whether this is gaming, writing, video” adds Design Education specialist Andrew Barnum. Macleay College has a long history of working very closely with industry, and compulsory internships are an integral part of all courses. This ensures that graduates are industry-ready and useful in the workplace from day 1. Panel consultant and UX specialist Kim Chatterjee mentioned that “In the future we will need graduates who can solve problems no matter what their nature. Then as they gain more industry experience they can move into strategy roles. It was important that learning experiences pit students against professionals and companies.” “If graduates can enter the workplace with the knowledge of how to create relevant content, and also how to develop and work with tools that will make money and save the world, I would hire them” added Ross Raeburn, panel member and CEO at UM Australia. Macleay College’s new Bachelor and Diploma courses in Digital Media combine conceptual development skills, strategic thinking, an understanding of relevant disruption, leadership and change management with digital production skills in DIGITAL PHOTOGRAPHY, VIDEO PRODUCTION, WRITING FOR DIGITAL COMMUNICATIONS, DIGITAL MARKETING & DIGITAL BUSINESS. These skills provide a great foundation for their careers – and combine real world skills that are relevant now, with an ability to self-learn and adapt to changes in industry and technologies that are bound to come. Ian Thomson is Head of the Advertising & Digital Media Faculty for Macleay College’s campuses in Sydney and Melbourne. Macleay College offers highly regarded, industry focused education in Business, Journalism, Advertising and now Digital Media. These tertiary courses have an emphasis on multi-media qualifications and offer students a hands-on approach to fast-track their career. The Bachelor of Digital Media features specialisations in DIGITAL VIDEO, WRITING FOR DIGITAL COMMUNICATIONS and DIGITAL MARKETING. Macleay College has campuses in Sydney and Melbourne. For more information, contact Macleay College on 1300 939 888. I have to say Sam Court’s UX course has started the Macleay year on a high! Instead of the traditional classroom setup, Sam invited us to have our lessons at The White Agency, helping to give us exposure to industry professionals like himself as he talked through all the nitty-gritty components in UX Design. ALSO Ping-Pong ladies and gentlemen, Ping-Pong! I’ve always wanted to learn about UX Design and honestly had no idea what it really was and what goes into – I just assumed it was the concept of graphic design. Oh how very wrong of me, it’s much more than that. Sam started by essentially teaching us how to think about UX Design. A great example is a technique called crazy 8s, which is a process that makes you create eight unique ideas in the space of five minutes. Not only that but you share your ideas to the class, and they take what ideas they like from you and you take what ideas you like from them. It’s cool because you evolve from the core of your idea and merge with other people’s ideas – #appropriation at it’s finest. You go and go, keeping it all really simple and visual by sketching (low-fi). I didn’t realise how well this process would originally work, but it’s kind of like stretching before a work out – you find your mind warming up to creativity and then BAM! Here comes all that creativity you had locked inside. Taking the thinking process further in regards to UX really truly amazed me. We got asked a simple question that stated; think of how many ways you could use this paperclip. Seems simple enough just write down how many ways you could use this paperclip. Now, depending on how many answers you came up with shows your ability of divergent thinking. The result with this test is that a pre-school kid will score a higher result in the test versus a high school student, due to a child being able to use his imagination to his absolute will. What does this have to do with UX? Well because a high school student becomes more educated he will know the uses of a paperclip, and simply state it’s uses, but a child thinks of endless boundaries. So in regards to UX you want to be able to do both, be a divergent thinker and a convergent thinker all in one. You start with your ideas and think about a problem, make the longest list of all of your ideas using your imagination to your hearts content then push the boundaries of what’s there and say “what’s not”? Then simply converge these ideas, narrow them down to its purest solution and address the problem you are trying to solve. So to address my earlier statement, no it’s not like graphic design. We were stunned when hearing that we were Sam’s first class, it feels honestly feels like the man has been teaching for years. There is still more to come from this class seeing as the trimester isn’t over. I can’t wait to present my final assessments with the rest of class and show off all that creative thinking. Daniel is currently studying the Bachelor of Advertising and Media. 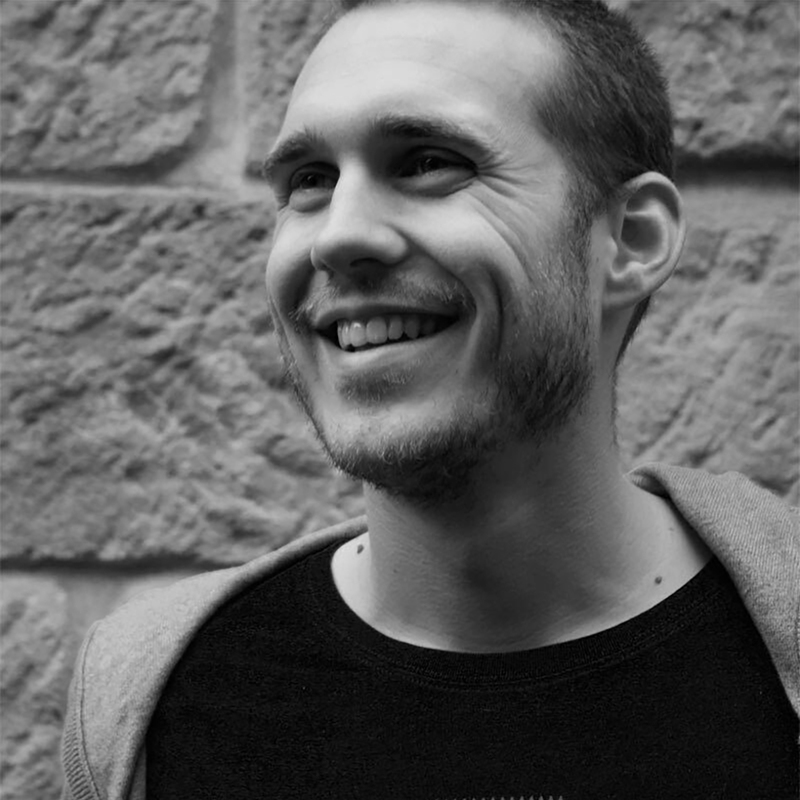 The User Experience class is taught by Sam Court, Head of Experience Design at The White Agency. Hi fellow AdBare readers! 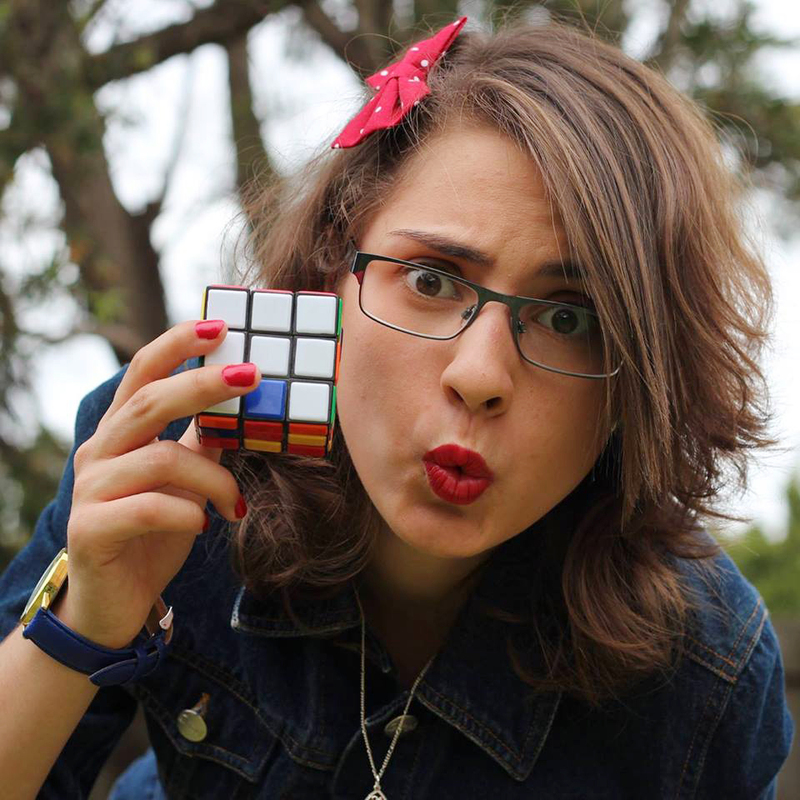 My name is Katerina Pappas I am from the States. I go to the University of Illinois Urbana-Champaign and I am currently a senior Advertising student. 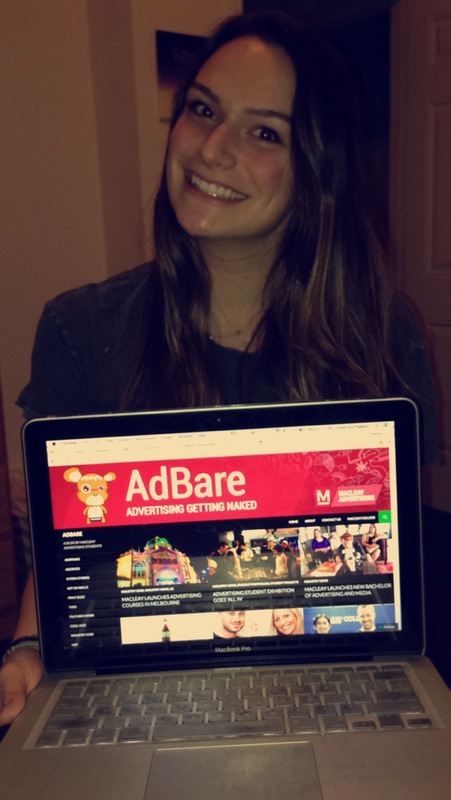 As I am in the process of a research project with a professor, I stumbled across Adbare. U of I (as we call it) is in the R&D stage of making a blog for Advertising students, similar to that of Adbare. My professor and I agreed, Macleay’s Adbare blog was the best benchmark/goal blog we saw! I had the pleasure of exploring the site’s content quite a bit as well as having a Skype interview with Ian Thomson, the head of faculty and chief editor for the site and would love to share my thoughts! The overall content the site provides is wonderful. I love the “Ad Speaks section” as well as the “Not” bad advertising section. The “Ad Grads” is great because it is not only an appreciation to Alumni from the school but also serves as a great Networking tool! I also think it is wonderful that student’s work and portfolio’s are displayed. I know as a student we create lots of unique/exciting projects and I can only imagine how great it is to see hard work pay off! Also, if prospective students are seeing the work Macleay’s students do, I am sure it is great to help them narrow down their school/major decisions if they see potential work they could be doing! My conversation with Ian was not only interesting but thought-provoking, eye-opening and inspirational. He walked me through how the blog started as well as the logistics behind how the posting works. I was furiously taking notes to understand how this great blog came to be! I really liked how he explained the blog was a learning tool. How it is more than just a blog and how students are taught blog etiquette, the blog spark conversations and dialogue as well as even help students contribute to their portfolio. I also liked Ian’s key point of, “students are engaging in real-world valuable skills. Having skills in a social media sphere where you’re often expected to write and update posts makes them really employable.” This is very true and I have seen it in previous interviews and internships where students are expected to elaborate on their experiences. Also it is special if you can bring skills to a position and continually build on them. Overall viewing the Adbare blog and speaking with Ian has helped me have a strong benchmark for our potential blog but really think about how as a student we have so many resources and learning opportunities available to us. Our industry is evolving every single day and let’s be honest we are so fortunate to be part of a hip, fun, engaging industry and culture of Advertising. Macleay’s blog really exemplifies this idea of the “different” people we are and being run by students makes it that much better! Thank you Ian for your insightful talking points as well as Adbare for being a role model for our blog. Looking forward to keeping connected, even 9,183 miles away! Macleay College has a long tradition of offering highly regarded, industry focused education in Business, Journalism and Advertising from it’s Sydney campus. Following the successful launch of it’s much talked about multi-media journalism courses from the new campus on Swanston Street, the college is proud to announce the launch of the Bachelor of Advertising & Media and Diploma of Advertising courses in Melbourne from February 2016. The advertising and media industries are calling out for educators to fill the talent gap in the rapidly emerging digital and media spaces. Macleay College is positioning itself on the forefront of the ever-increasing collaborative space between creative, management and media. 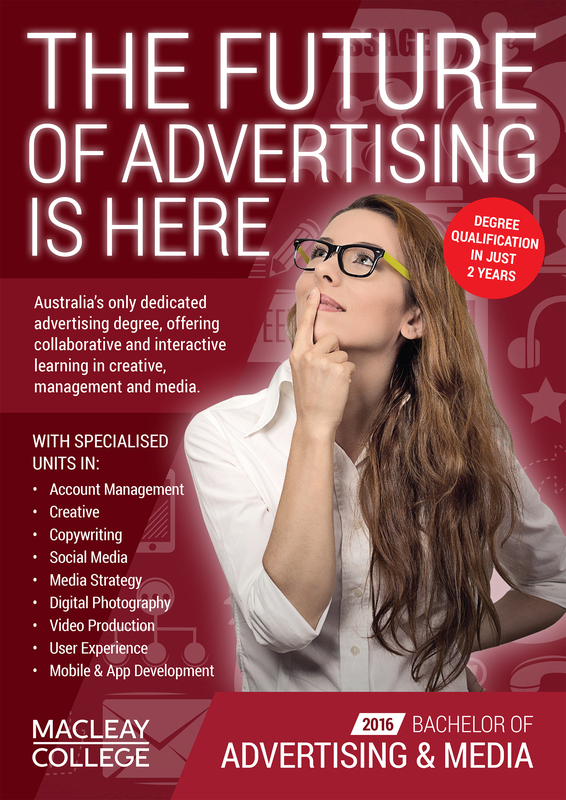 The newly accredited Bachelor of Advertising & Media is Australia’s only dedicated advertising degree (not simply a major as part of a marketing or communications qualification), and combines units of study in marketing & media, creative and digital, with management & production. So students have the opportunity to learn industry-based skills in a truly integrated and collaborative environment – and that, due to the 3-trimester system, in 2 rather than 3 years of full-time of study. It is also interesting to note that when planning an international career, a bachelor qualification is mandatory for a US working visa. 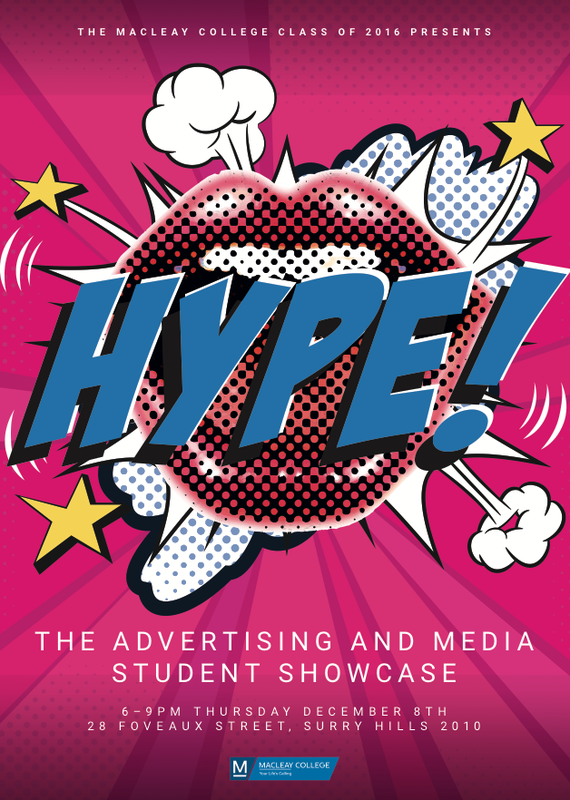 In addition, the college is also offering it’s well established Diploma of Advertising, a one year intensive course that gives career starters a great overview of all areas of the advertising industry, and career and/or study changers a fast-track into a career in Adland. Graduates include Robert Concepcion, art director at Anomaly in New York, Will Edwards, associate creative director in JWT Sydney, Daniel Cutrone, investment director at Initiative Media, Jo Butler, founder & managing director at Platinum Media & Communications and Alex Roberts, Director at Finch Film Production, just to name a few. Study-changers who have found great success and immediate jobs on completion of the one-year diploma have come from such diverse areas of study as: psychology to become brand strategists, graphic design to become art directors, journalists to become copywriters, and marketers to become social media specialists. The course will appeal to enterprising individuals who are interested in combining their know-how as strategic thinkers, innovative organisers, creative spirits or numbers people – and who are interested in the emerging career opportunities in the increasingly diverse industries of advertising and media. Day and evening classes start at the new Melbourne campus at 55 Swanston Street on February 8. For more information contact Ellen Rafferty on 0477 733 522.